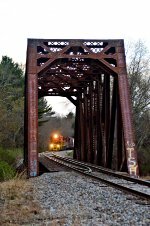 Description: NECR southbound 500, the Wood Chip train, passes under Lime Kiln Road in Winooski, Vermont. Today's train consists of GP38-2 2048 and 26 wood chip hoppers. Description: NECR southbound 500, the Wood Chip train, approaches Lime Kiln Road in Winooski, Vermont. Today's train consists of GP38-2 2048 and 26 wood chip hoppers. Description: NECR 610 heads north past the spot that the FItchville Junction branched off of the Palmer Sub at the Yantic/Franklin town line. The spot where the two lines joined is right behind me. Description: A northbound crosses RT 44. Description: Two GP40-2Ws lead a GP38 north on the New England Central. Description: NECR 608X starts work at KofKoff Feeds around 6:00 am. Description: 640 northbound at Monson, Mass. Description: Northbound NECR runs along the Willimantic River. Description: Approaching Merrow Road Grade Crossing. Description: An antique car paces 640 Extra. Description: 640 at Safford Springs center. Description: Northbound climbs the grade at the Connecticut and Massachusetts state line. Description: CSO-5 heading north from Hartford to Bradley Airport in Suffield. Description: Waiting for their next trip to Connecticut. Description: Coming south past Wallingford station. Description: CSOR 3399 - CSOR 3398 - NECR 2048 rest at West Springfield Yard. Description: PW 2215, temporarily running on CSO after being dead for months, leads CSO-4 back towards Hartford.